The small man with the over-sized head smiled knowingly, the half-man-half-woman stared disconcertingly, the African prince squinted curiously, and the hooked-nose devil tiptoed past fleetingly. Other masqueraded figures laughed, chatted and gazed at us as we circled the ballroom of Cesky Krumlov Castle. We were asked to imagine the room candlelit, with the mirrors scattered amid these painted characters catching the light, marrying reality with fantasy–connecting the two worlds. 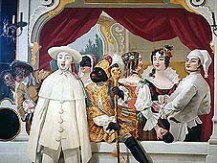 Yet it wasn’t until we entered the Castle’s baroque theater that we really became engulfed in a time long past. 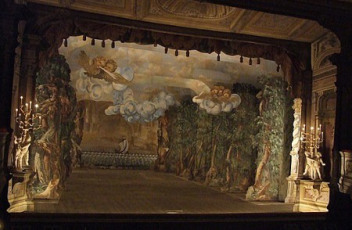 The best preserved example of the period (dating to 1765), with 85% of its various elements in place, from stage sets and mechanisms to librettos and costumes, this theater is truly one of the great gems of the Baroque period (http://www.baroquetheatres.com/en/). Standing there in the cold, dim, pseudo-candlelight, my eye was drawn to the dreamlike scene on stage—a cherub’s face leaning on a floating cloud, a central stone fountain adorned with fawns, elaborately carved topiary hedges along the wings, and a classic garden off in the hazy distance. It’s the perfect setting for a Racine, Corneille or Shakespeare scene. 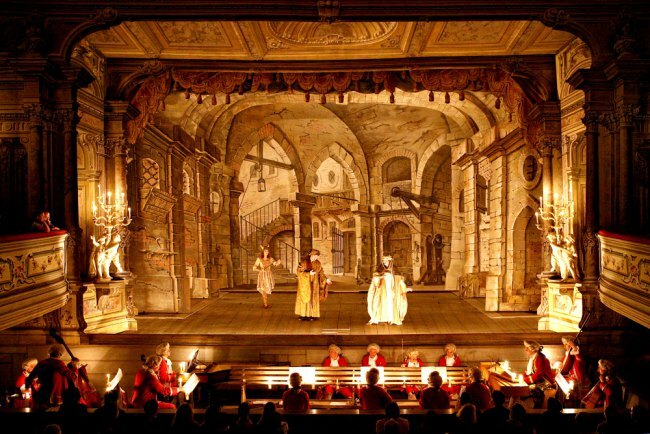 In fact, the ethereal stage evokes a mood conveyed in A Midsummer’s Night Dream, first performed early in the Baroque era. Titania, Queen of the Fairies, could happily woo her beloved Bottom here and Puck could engage in all kinds of mischief. Beneath the stage, the magic of the theater is laid bare. A central, horizontal wooden pillar with turning handles allows stage hands to attach ropes to the sets on both sides of the stage and rotate them off and on between scenes in 12 seconds flat. During this time, special effects, including fireworks and sound effects, were often added to camouflage the noise and distract the audience. A small elevated box beneath the front of the stage was carved out for the prompter to whisper forgotten lines to actors. 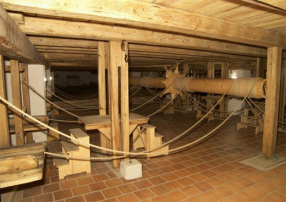 Another wooden platform attaches to a pulley to hoist actors to the stage through a trap-door. 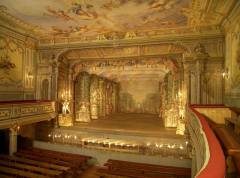 The fact that the Cesky Krumlov theater has never once burned is a miracle, and it is to the town’s credit that its restoration (from 1966 to 1997) was meticulous and extensive, safekeeping a spectacular portal to another time and to the foundation of an art form that humans continue to perfect today: illusion.